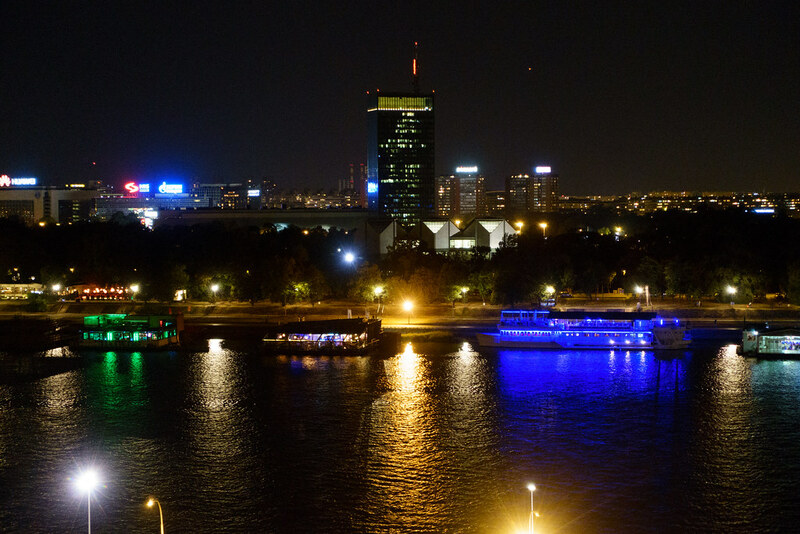 Post 8 of a series detailing our Eastern Europe road trip. View all the posts so far here. 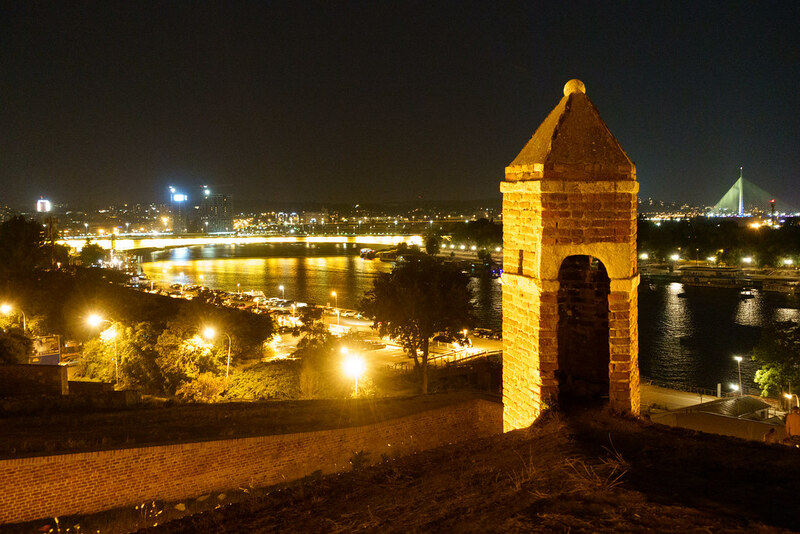 We stopped in Belgrade for just two nights/one day, driven by a desire to experience Serbia the country more than its capital in particular. 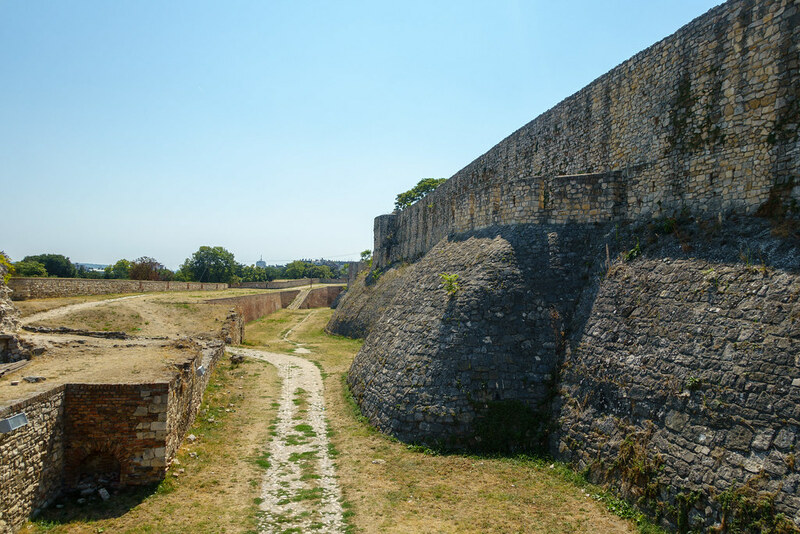 It gave us just enough time to relax and swim at the city’s riverside beach, roam its impressive medieval fortress, and get our fill of the typically meaty, cheesy, and fast-food-esque national cuisine. 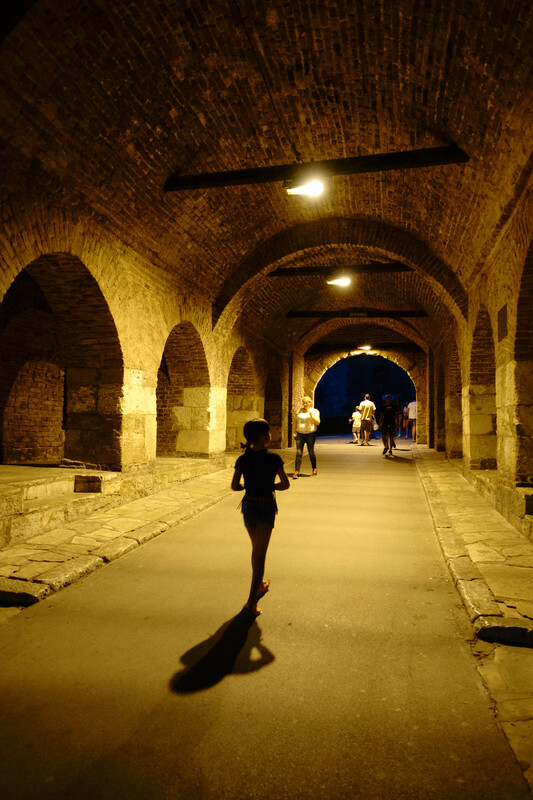 The night we arrived we decided to stay in, and fortunately the remainder of our massive sandwiches from Timisoara were ample to sustain us. We took advantage of the large TV by watching the Discovery Science channel – an obvious winner with its combination of English language and decent subject matter. 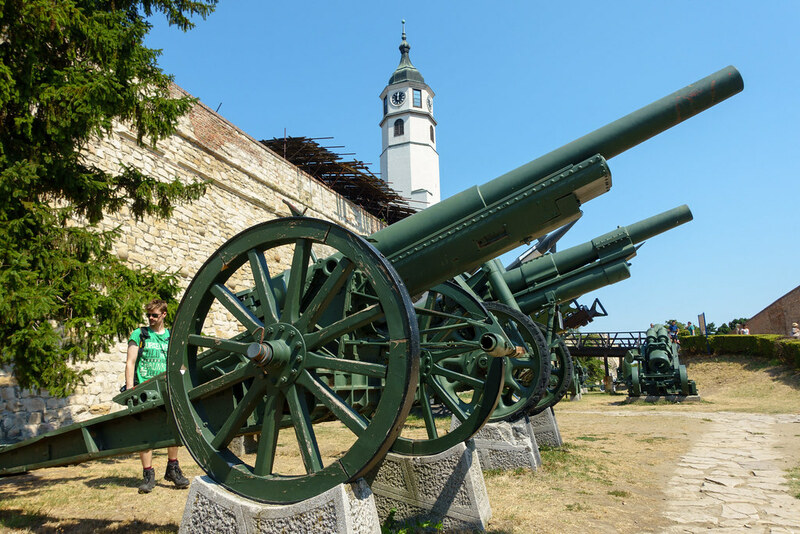 Next morning we went to Hotel Moskva for breakfast, which was helpfully halfway between our flat and Belgrade Fortress. The outside temperature was already boiling hot, meaning we were too warm even sitting outside in the shade! It was nevertheless a very pleasant breakfast spot, thanks to the live pianist and five-star service. 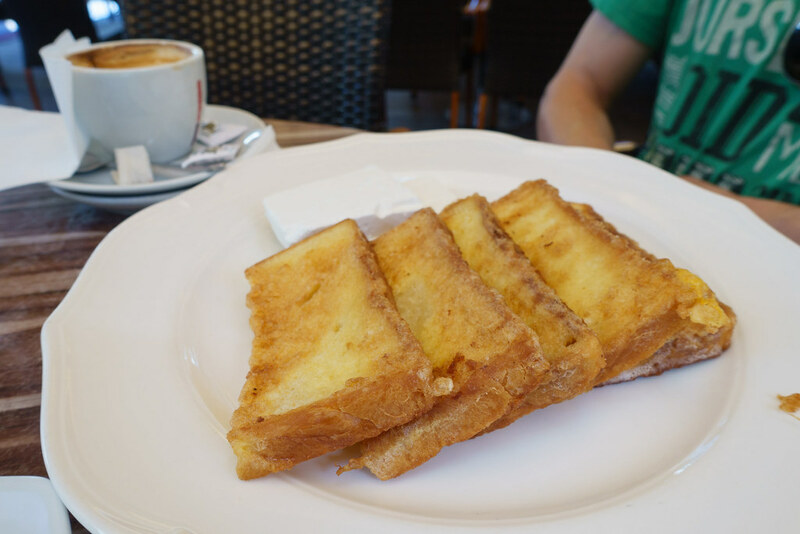 Breakfast was light and a little expensive in Serbian terms, but very nice. 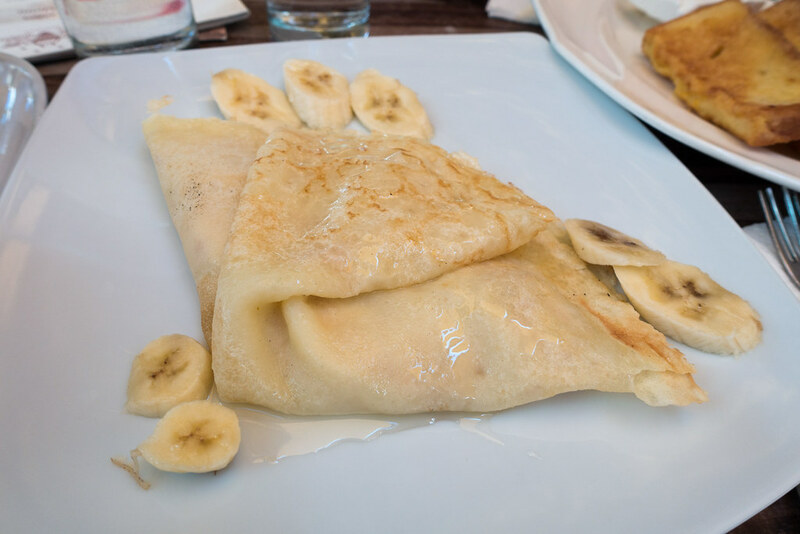 I had thin, pale crepes with bananas and honey, while Steve had French toast with a block of spreadable cream cheese. 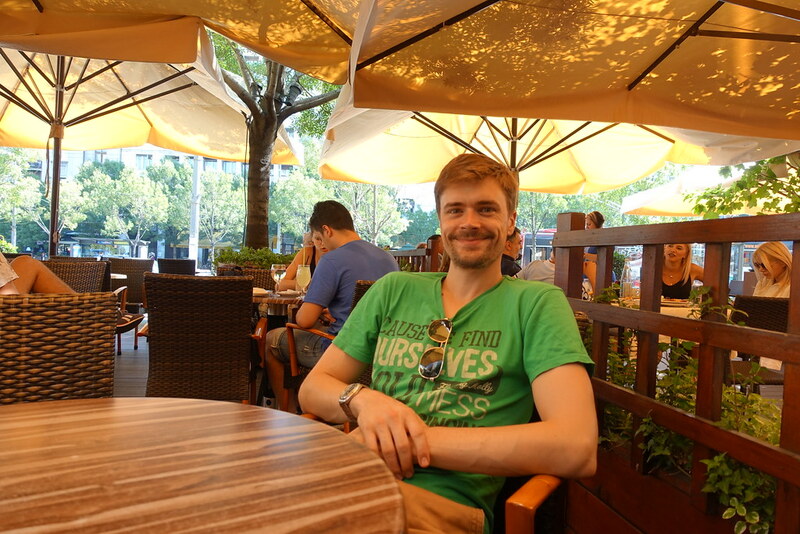 We sampled a few of Moskva’s wide range of fresh fruit juices, as well as their tea and coffee (which was very good). 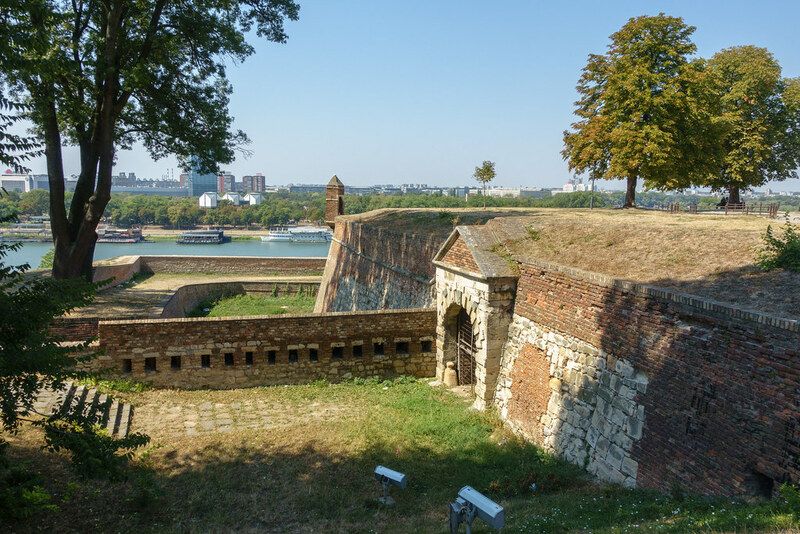 Belgrade Fortress is a primarily a grassy hill reinforced by a variety of stone walls, turrets, tunnels, and drawbridges. 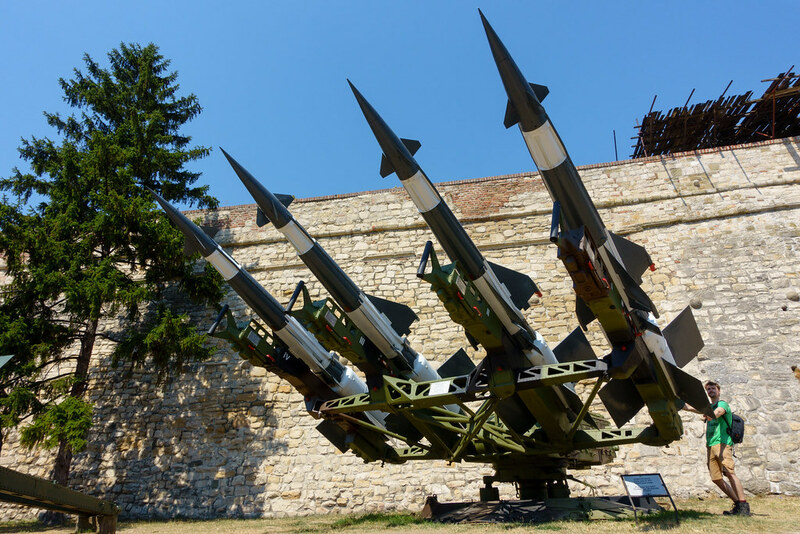 It also holds a military museum (shut when we visited), a café, and, randomly, a park of animatronic dinosaur statues. It’s free to walk around, with payment only required if you want to visit attractions such as the museum, the dungeons, or the dinosaurs. 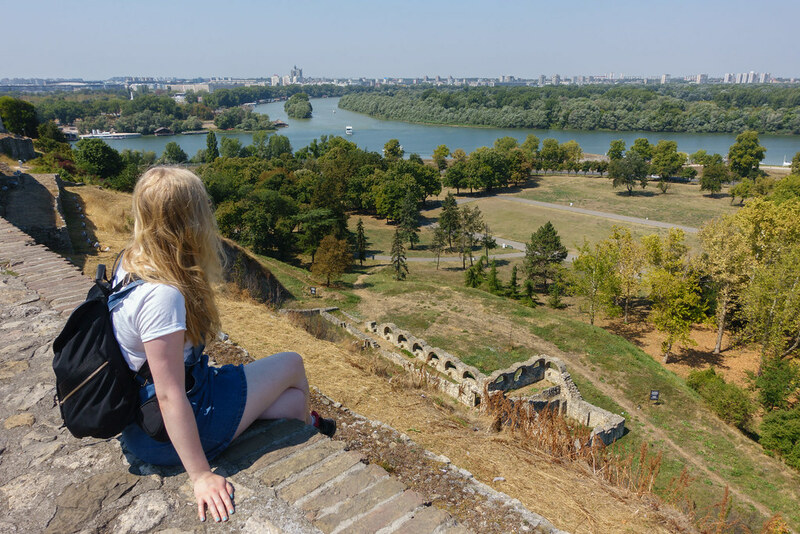 The views across Dunav and Sava Rivers from the top of the highest walls are spectacular, and the many stone structures provided ample nooks and crannies to explore. 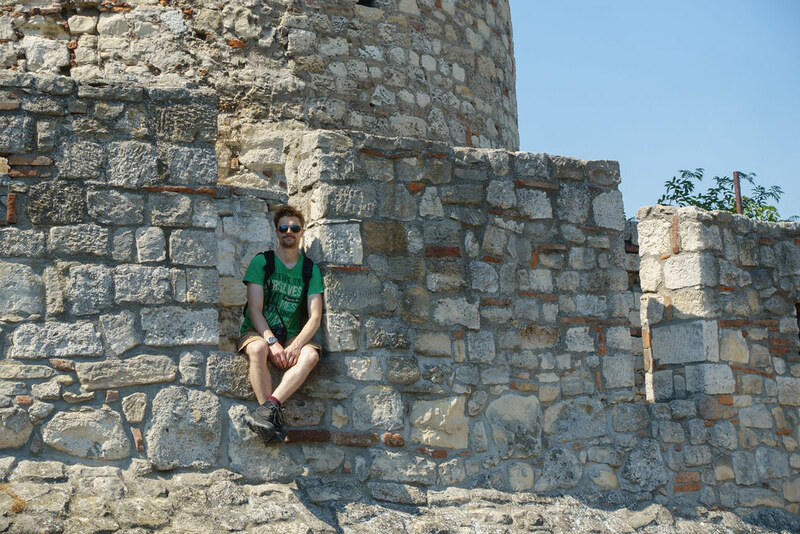 I thought it entertainment enough to explore these ramparts, without forking out to visit the specific attractions. 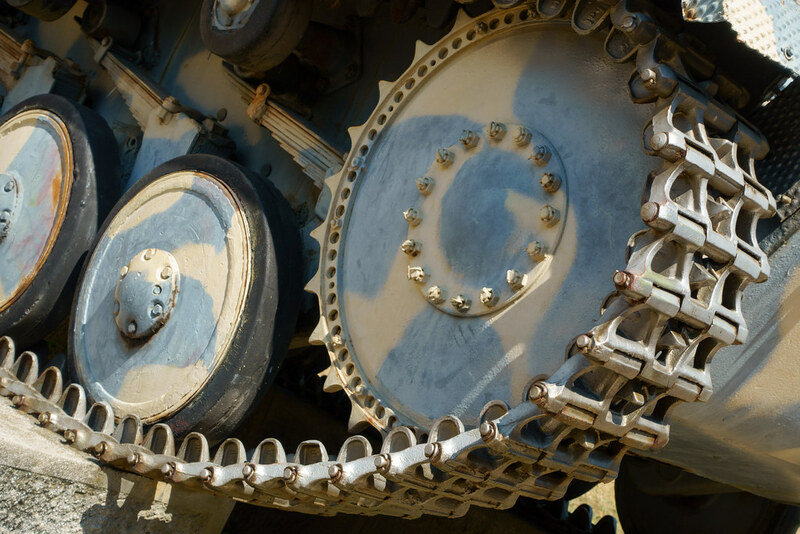 Although the military museum was shut when we visited, there were many weapons and tanks displayed out in the open and we took full advantage of the photo opportunities! 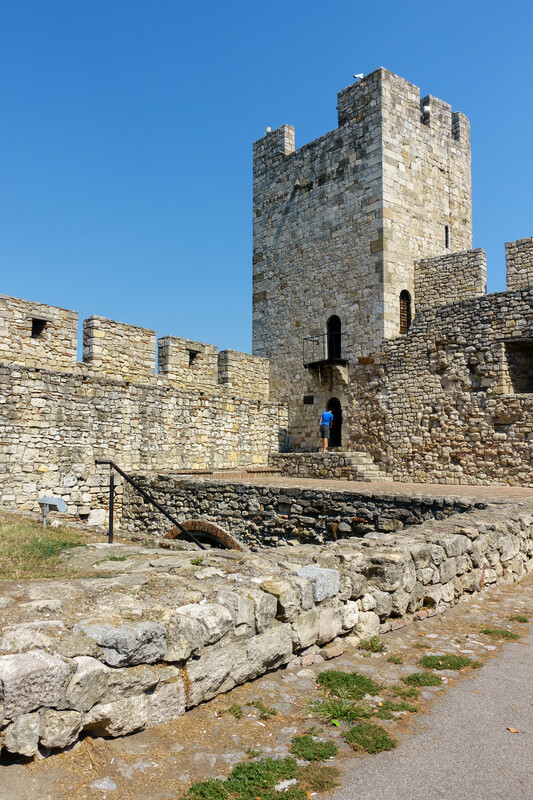 Having walked the circuit of the fortress, we headed back into town. 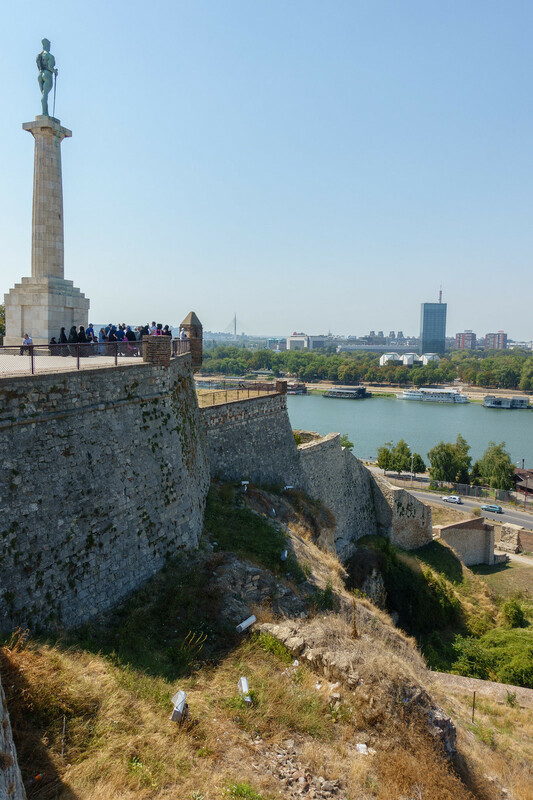 The main path out of the landscaped park surrounding the fortress leads straight into Belgrade’s main high street, Knez Mihailova. 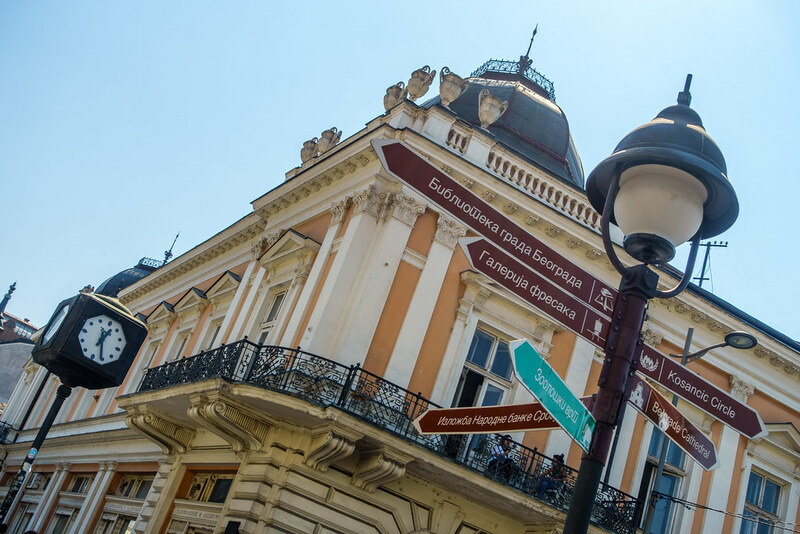 This wide, modern, pedestrianised street is lined with all manner of restaurants and high-end shops, and crowded with people, entertainers, and ice cream vendors. 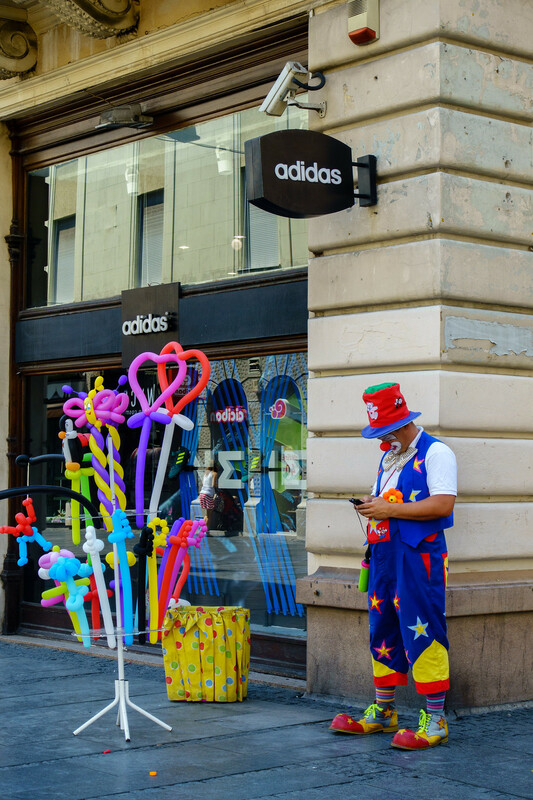 Much to my amusement, there were even clowns selling balloons (and not looking very happy about it)! 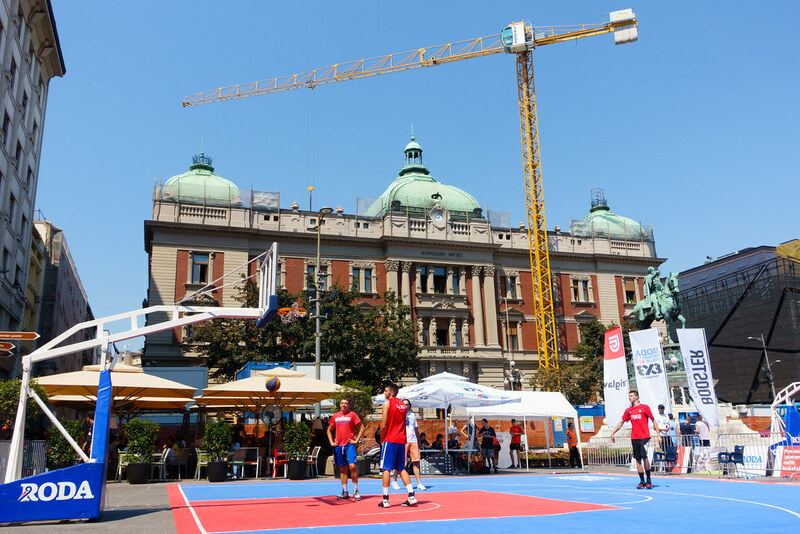 Reaching Republic Square, we were surprised to find a basketball game underway right in front of the National Museum. We stopped and watched while deciding what to do for lunch. Steve had little appetite, so we needed somewhere quick and casual. Drama Cevapi offered just that, and most importantly the chance to try some Serbian ‘street food’. 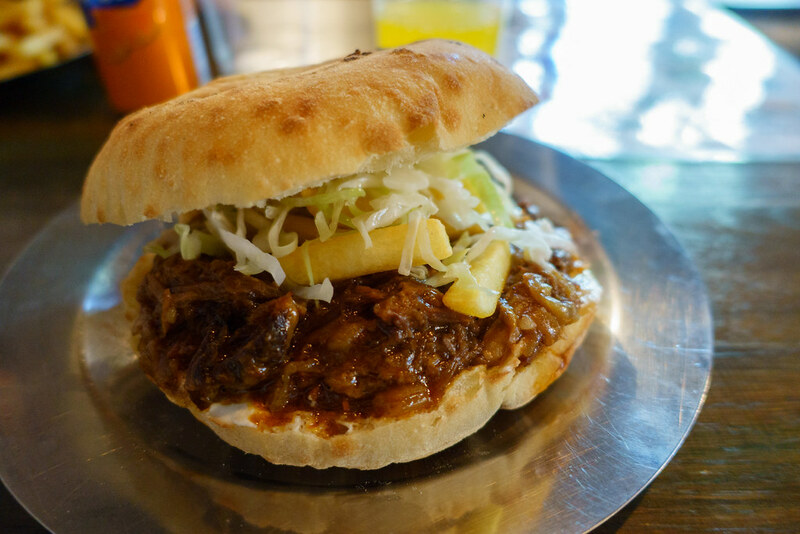 Rather than go for the cevapi – Serbia’s version of beef kofte – I went for the ‘Drama special’ of a bread roll filled with pulled beef in a black beer sauce. This sandwich was incredibly rich, moist and flavoursome, and too large to finish. The chips were great too: hot, fresh and crisp. There were even some stuffed into my roll! 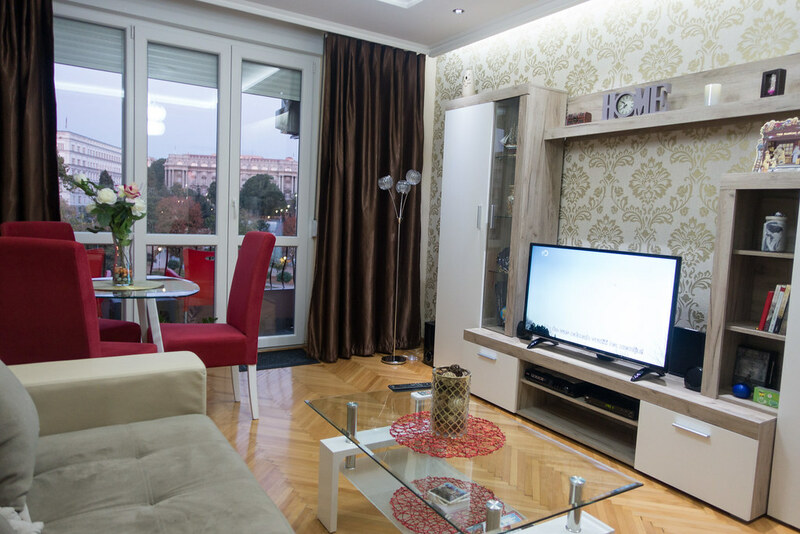 It was with considerable difficulty that we located a bus to Ada Ciganlija, the island in the middle of Sava River. Linked to the city by a wide road bridge, the island is dedicated to recreation and offers a pebble beach, sports facilities, and a long strip of waterfront restaurants and bars. 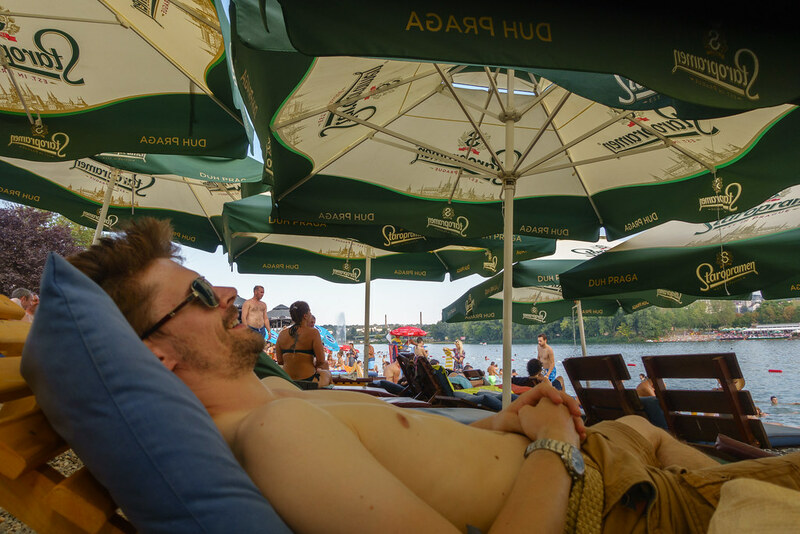 We bought drinks at a bar before finding two shaded sun loungers and setting up there for the afternoon. 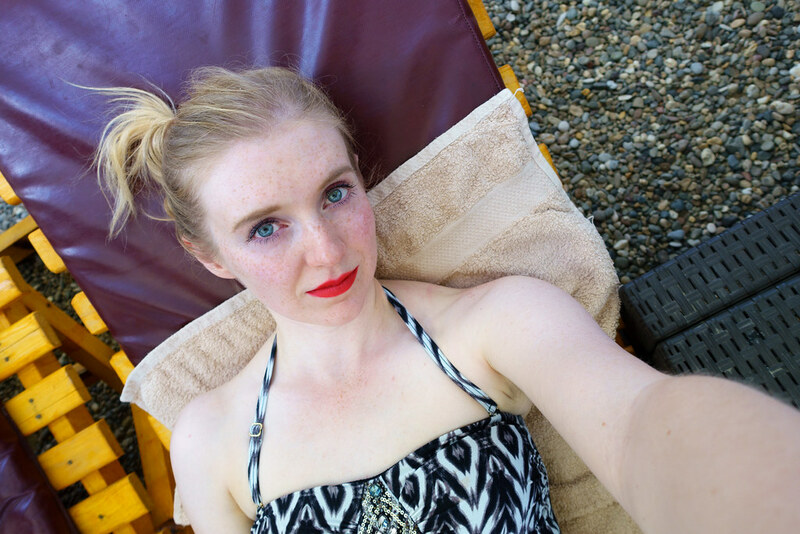 Pushing aside my reservations about swimming in an inner-city river, I changed into my swimwear in one of the free changing booths and ventured in for a dip. The water felt glorious, providing exactly the relief I needed from the scorching afternoon sun. We swam and relaxed for around two hours before getting the bus back into town. 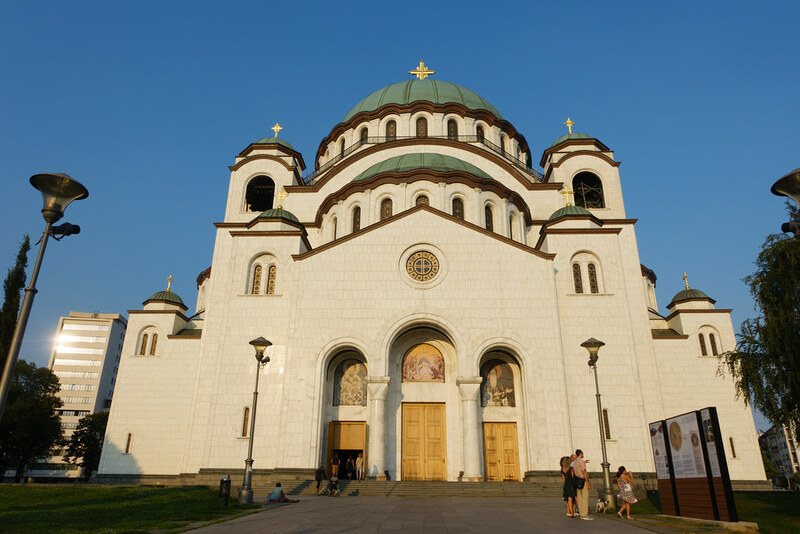 At my request, we hopped off to see Sava Temple – the world’s largest Eastern Orthodox church – before walking back through the city to freshen up at our airbnb. The walk gave us a good chance to see the city at large. 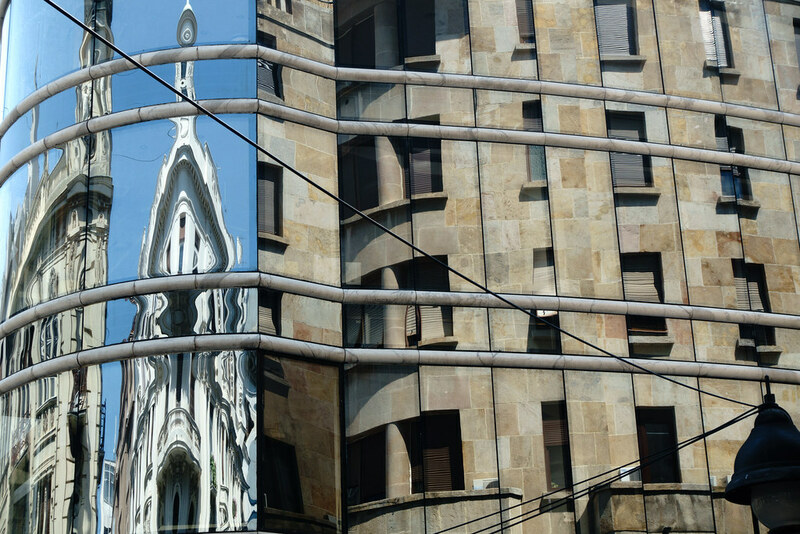 Belgrade doesn’t come across as a ‘pretty’ city – its architcture is dominated by grey, post-war brutalism, save for its grandiose government buildings and museums. 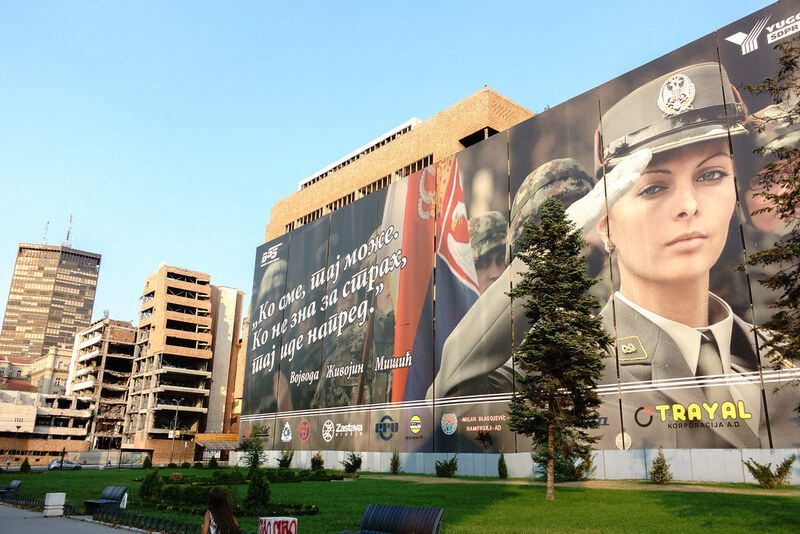 And yet parts of it were quite striking, not least the giant billboard we spotted that looked like it was encouraging women to join the army. We wanted to revisit the fortress to watch the sunset from there, but missed it because the walk took longer than anticipated. However, we were glad we’d returned. 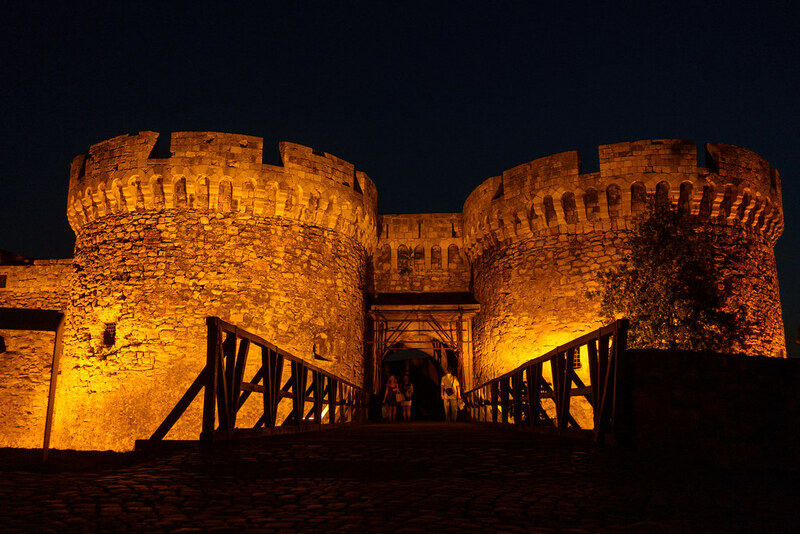 The fortress seemed a completely different place after dark. 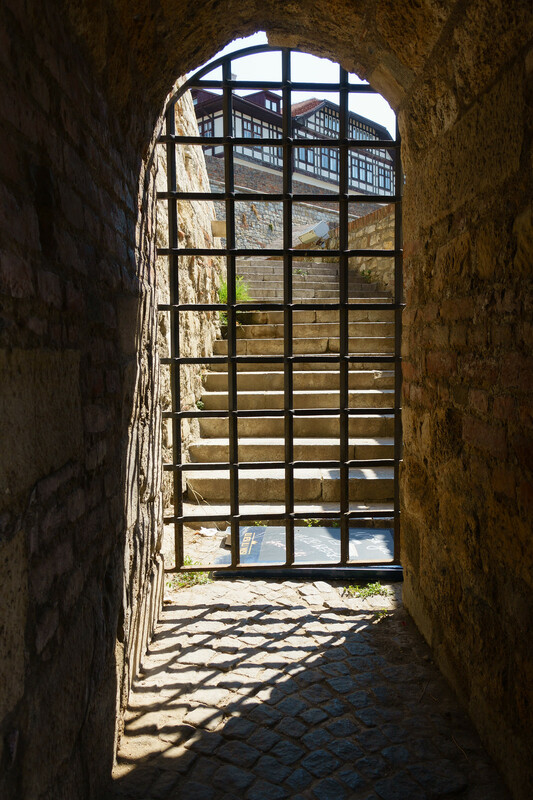 With its medieval stone walls illuminated and majestic, and many corners pitch-black and mysterious, it was easy to imagine that we’d gone back in time and were sneaking around the fortress illegitimately. 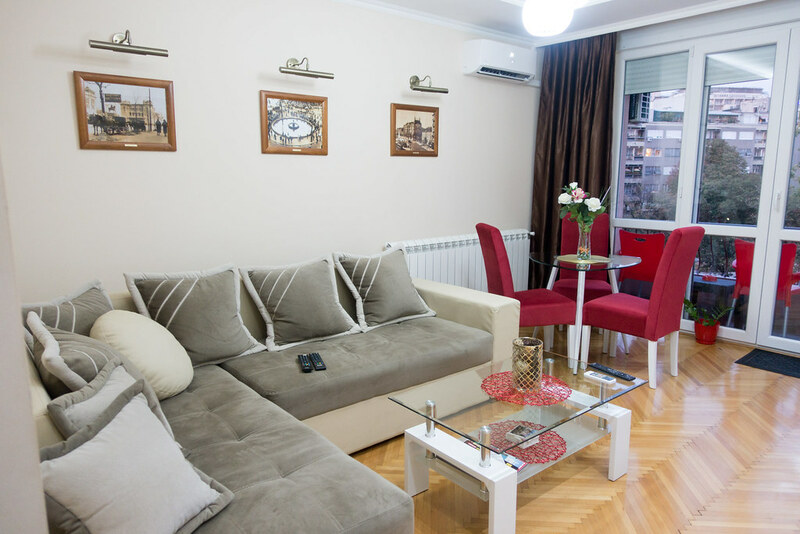 The panoramic view of the river and the city beyond, too, had completely transformed. Restaurant Zavicaj was on the way back to our airbnb and, by a complete stroke of luck, a table became free just as we walked in. 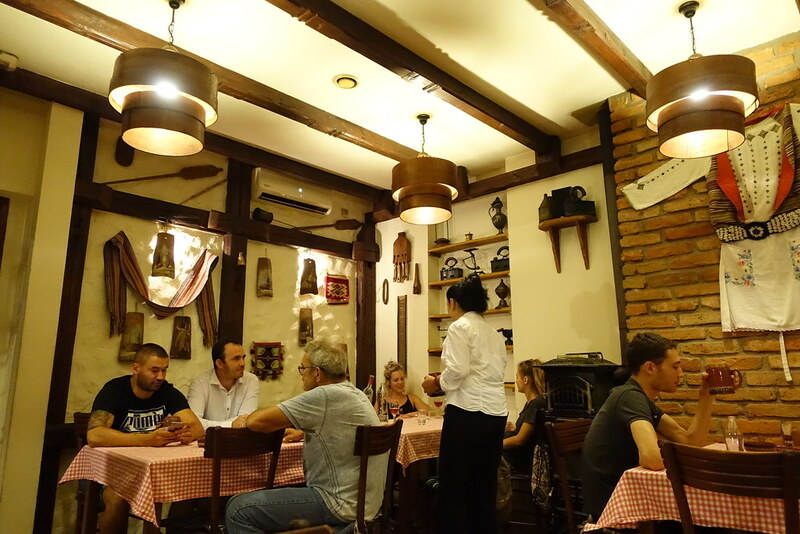 I was charmed immediately by the warm atmosphere and the traditional Balkan decor of red checked tablecloths, rustic walls, and wooden rafters. 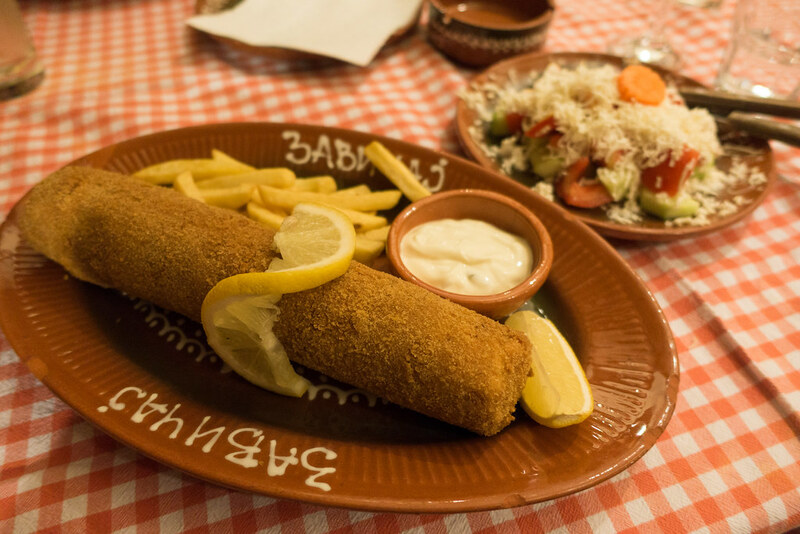 The menu offered many tempting options – as long as you’re a meat eater – but I couldn’t resist the calorific draw of the Karađorđe’s schnitzel: a large breaded and fried cylinder of pork, filled with melting kajmak cheese. This came with chips, lemon and mayonnaise, but the persuasive matriarch serving us (possibly the restaurant’s owner) convinced me to have a Greek-style salad on the side. This came covered in cheese. Despite coming nowhere near finishing my meal, I greedily relished every cheesy, carb-loaded bite (and took what was left home in a doggy bag). 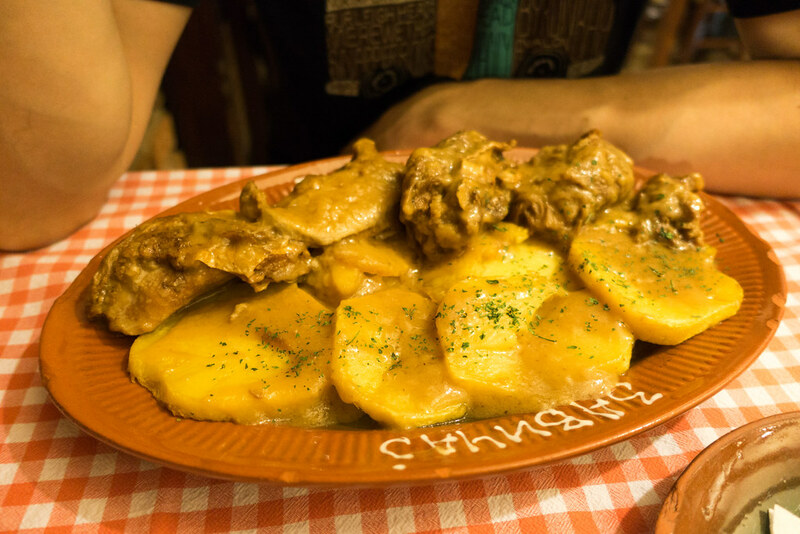 Steve’s meal of lamb with gravy and potatoes cooked under a sač was luxuriantly rich and saucy. Served with a side of pickled cabbage (again, recommended by our server), it was an even bigger meal than mine. I was quite devastated to realise that we couldn’t finish the massive plateful, and that it was simply too moist to survive a doggy bag. Sadly, we didn’t have room for dessert! It was a most satisfying Serbian feast to complete our brief but eye-opening time in the country. 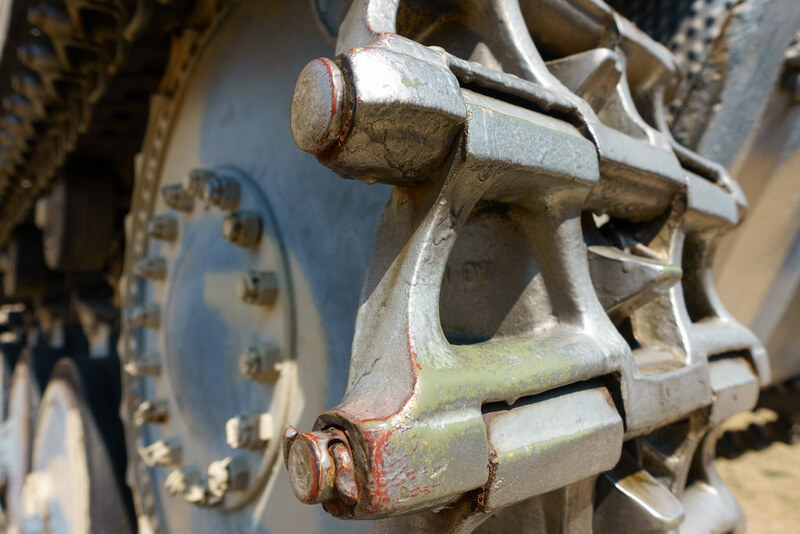 The following day we would pack up, get back on the road and drive to our next country: Bulgaria. 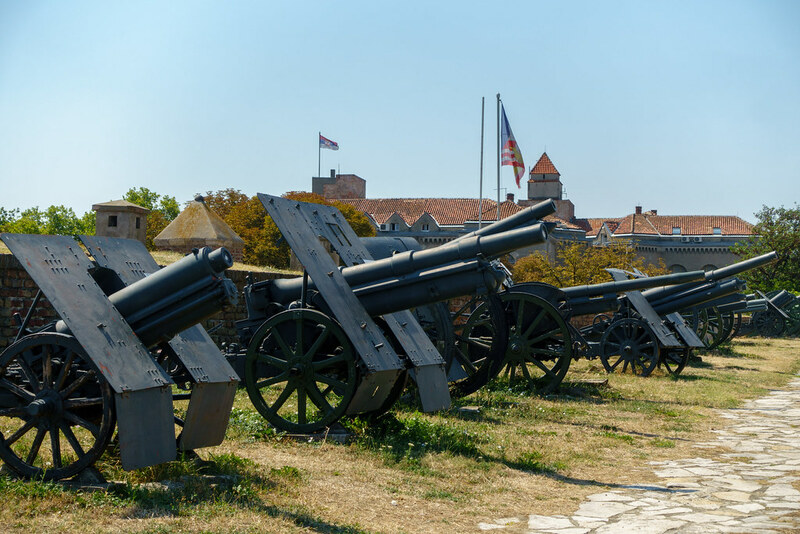 Posted in Eastern Europe, Photography, Serbia, TravelTagged Ada ciganlija, Belgrade, beograd, Fortress, hotel moskva, zavicajBookmark the permalink. Thank you! And yes… it certainly was!